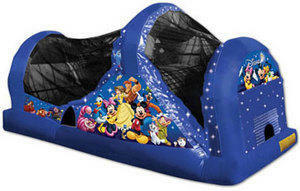 This licensed World of Disney Backyard slide brings magic and fairy dust to your next get together. The ensemble of Disney stars takes their places on the fantastic art panels, including Tarzan, Cruella, Pooh and the gang, Lilo and Stitch, Pocahontas and more. Ariel and Genie make appearances on the archway, and Mickey and Minnie can are waving goodbye at the back end of this adorable dry slide. Kids can choose from three activities including a jump area, or a dual-lane climb and slide for hours of fun under the stars of Disney. High-visibility mesh around all sides allows parents and spectators to view the delightful play. This dry slide combo is part of an enchanting line of licensed World of Disney products from Ninja Jump. The World of Disney dual dry slide is a great way to promote enjoyable and healthy activity, and will add excitement and value to any indoor or outdoor event! With a variety of colors, shapes and themes, the slides from Ninja Jump offer kids of all ages endless amounts of aerobic activity. Our slides are made safe and secure with lite n strong™, fire-resistant vinyl making it safer, portable and more durable.